Virtual Reality has dominated E3 this year and is bound to only get more prominence as more games are released for VR. 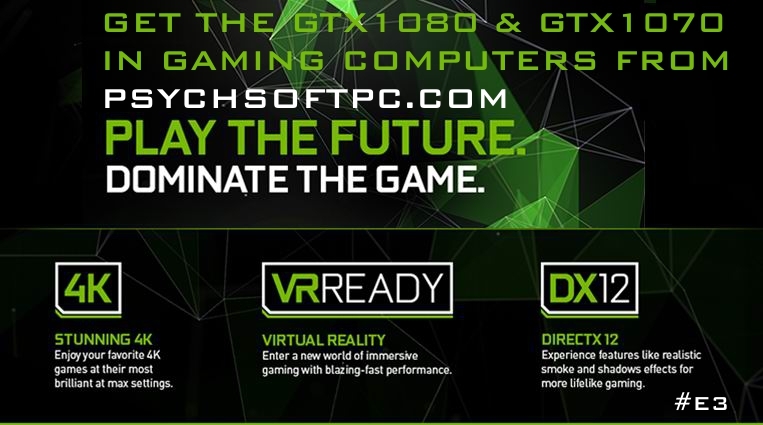 In time for E3, Psychsoftpc announces a full line of Virtual Reality Ready 4K Gaming Computers based on Intel Core CPUs and NVidia GPUs based in the Virtual Reality Ready Pascal Architecture. With the Pascal Architecture based GTX 1080 and the GTX 1070 Graphics Cards and high performance Intel CPUs, the Psyborg Extreme Gamer PC line is ready to handle the demands of Virtual Reality gaming on demanding Oculus Rift, HTC Vive and OSVR gear as well as 3D gaming on 4K screens. Psychsoftpc is serious about supporting Virtual Reality Gaming and current and future VR gear such as Oculus Rift, HTC Vive, OSVR and Microsoft Hololens. 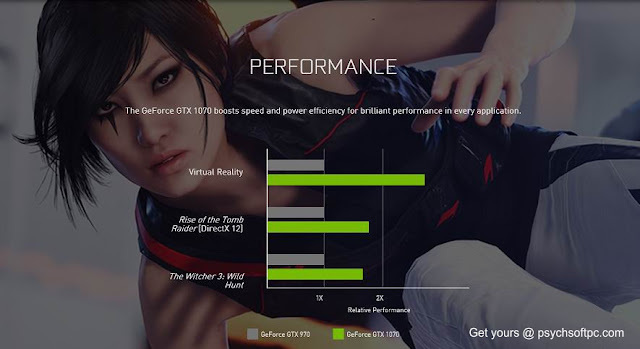 That is why they are making Virtual Reality Ready Gaming PCs based on the NVidia Pascal GPU technology. Pascal is the world’s most advanced GPU architecture, delivering truly game-changing performance, innovative technologies, and immersive, next-gen VR offering brilliant gameplay with captivating sights and sounds giving folks a whole new way to game. NVidia GTX GPUs powered by Pascal give next-generation VR performance, the lowest latency, and plug-and-play compatibility with leading headsets through NVIDIA VRWorks technologies. Virtual Reality audio, physics, and haptics let folks hear and feel every moment. NVidia GTX 1070 and GTX 1080 Pascal based cards support full 4K gaming. 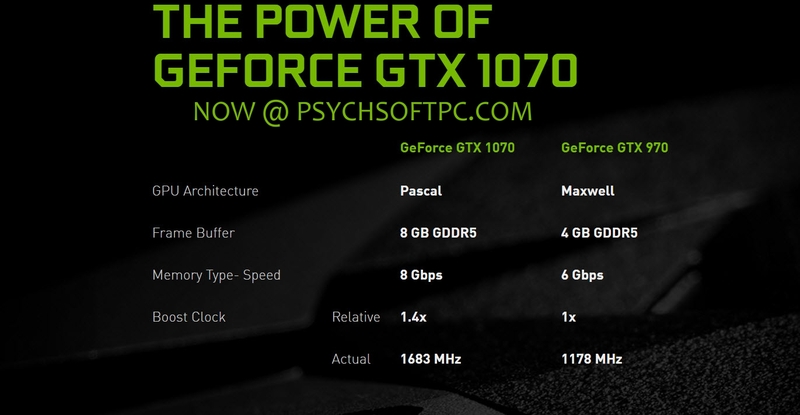 And these Pascal based cards are DirectX12 compatible for more life-like gaming in Windows 10. The 4K revolution has arrived on PC, and if folks haven't yet experienced the wonders of Ultra HD gaming, they should. With four times as many pixels as common 1080p displays, 4K monitors can make newer games breathtakingly immersive, and can even add new life to older titles through high-resolution texture packs and mods. Of course, in addition to a 4K monitor, folks will need a boss gaming rig like those from Psychsoftpc with a powerful graphics card like the Pascal based GTX 1080 or GTX 1070 to do them justice because gorgeous visuals don't mean much if the frame rate drops to a crawl. A large number of polygonal games already support 4K, either natively or through config file changes, and each looks jaw-droppingly good and when folks play the latest blockbuster games at 1920x1080 on their top-end PC they’re not getting the complete experience as most developers create textures and other assets at much higher resolutions, and compress them when playing at lower screen resolutions. When people game on a 4K monitor they can see all the detail and experience all the nuance. Next to VR, 4K is the next big thing in gaming, and once folks have seen and experienced its awesomeness they’ll never want to go back to plain Jane resolutions ever again. If they wear their enthusiast gamer badge with pride and like to think they have the best of the best in PC gear, then they need a 4K system. They owe it to themselves to experience the breathtaking vistas 4K can provide. As the gaming world moves more to Virtual Reality and all the demands that puts on a system, better gaming machines with better GPUs are becoming more necessary. Even if folks aren't embracing VR gaming yet, it is important that their systems are ready for it. After all, a gaming computer should last a long time and give years of high performance use. That's why Psychsoftpc embraces the latest in Graphics innovations and strives to make their machines not only ready for today's gaming but gaming in the years to come. 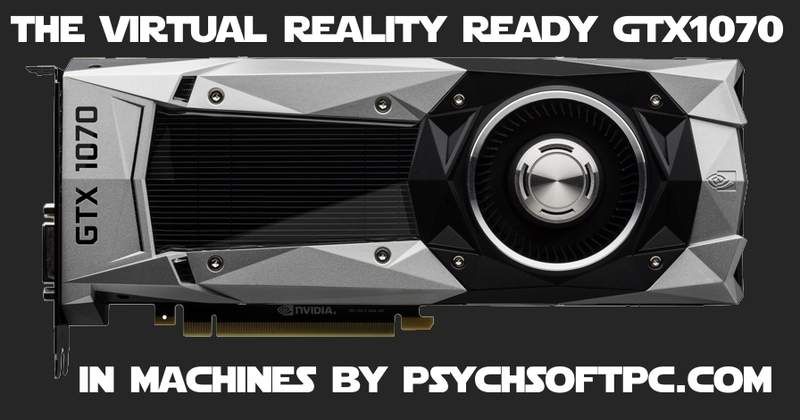 Psychsoftpc is serious about supporting Virtual Reality Gaming on Oculus Rift, HTC Vive and OSVR and so is NVidia. That's why Psychsoftpc is replacing all GTX 970 GPUs with NVidia's blazingly fast Virtual Reality Ready GTX 1070 in its second tier Psyborg Extreme Gaming Computers, offering a full range of price points of Virtual Reality Ready Gaming PCs based on the NVidia Pascal GPU technology. In benchmark runs, the 1070 was able to beat out every AMD card, including the Fury X, as well as Nvidia’s 980 Ti and Titan X in 3Dmark Fire Strike, even at the highest resolutions. It was even able to beat out the 980 Ti’s average and minimum frame rates in Overwatch. For an affordable price point, this card delivers nearly everything that the previous $1000 card did at a much lower cost. And when you compare the GTX 1070 with its predecessor the GTX 970, the difference is staggering. 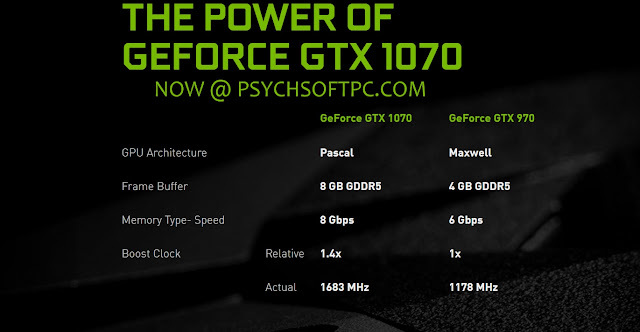 The GTX 1070 is based on the new Pascal architecture where as the GTX 970 was based on Maxwell. Pascal is the world’s most advanced GPU architecture, delivering truly game-changing performance, innovative technologies, and immersive, next-gen VR offering brilliant gameplay with captivating sights and sounds giving folks a whole new way to game. The GTX 1070 increases the RAM to 8 gig from the 4 gig of the GTX 970. But it's in the clock speed that you can really see the difference. The GTX 1070 offers an incredible 1683 MHz while the GTX970 comes in at a mere 1178. All this adds up to a nearly 30% performance boost by GTX 1070 over the GTX 970. And when it comes to gaming, particularly Virtual Reality gaming, that can make quite a difference in what folks see on the screen or in that Oculus Rift headset. NVidia GTX GPUs powered by Pascal give next-generation VR performance, the lowest latency, and plug-and-play compatibility with leading headsets through NVIDIA VRWorks technologies. Virtual Reality audio, physics, and haptics let you hear and feel every moment. As the gaming world moves more to Virtual Reality with Oculus Rift, HTC Vive and OSVR and all the demands that puts on a system, better gaming machines with better GPUs are becoming more necessary. Even if folks aren't embracing VR gaming yet, it is important that their systems are ready for it. After all, a gaming computer should last a long time and give years of high performance use. That's why Psychsoftpc embraces the latest in Graphics innovations and strives to make their machines not only ready for today's gaming but gaming in the years to come.